As much as I love Wes Anderson and his style, when another director comes along and tries to duplicate it (and there are many pretenders), I find it insufferably annoying, and difficult to pay attention to anything else. 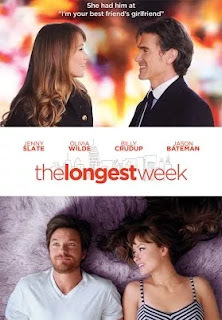 "The Longest Week" is shameless, even egregious Wes Anderson ripoff from the bold block lettering of the titles (while it isn't Anderson's trademark Futura, it might as well be), to the numerous prop shot cutaways, to the slow motion set to verbose narration and classical music. Conrad is the Andersonian affluent, middle-aged, womanizing man-child living large off his parent's fortune despite having never earned a dollar himself. He's also an aspiring writer, who has yet to complete what he considers his sophomore novel, even though his first novel was never finished or published. Lately he's been cutoff by his parents, and as a result he's forced to move in with his best friend Dylan (Billy Crudup). The two grew up together competing over everything, including their relationships. Dylan continually begs him not to steal another girl from him, our indication that the following story has played out again and again. Dylan's latest almost girlfriend is Beatrice (Olivia Wilde), a model that quickly gives her phone number to Conrad while on the subway simply because he was looking her way. So clearly whatever relationship she may have been forming with Dylan was tenuous at best. At a party where Dylan formally introduced Beatrice to Conrad, the two immediately begin competing for her affections, but its clear Beatrice is more interested in Conrad. They secretly build a mostly happy relationship, at least when Conrad isn't sabotaging it for no reason. Yet later on the film takes a sudden turn to make Conrad out to be the bad guy who "stole" her from Dylan, as if to forget her role in everything. Nevertheless, the obvious next step is to make Conrad come clean with Dylan and see how they get over the deception, and whether or not Conrad can change his womanizing ways and settle down with Beatrice. The narration's description of these characters is overly wordy in an attempt at witty, playful descriptions that come off as pretentious despite the film's repeated attempts at subverting pretension by calling attention to pretension itself. Worse yet these descriptions don't amount to much as they tend to not properly describe the things they're about. For instance, Dylan is described as, "a closet conversationalist," and a "clinical neurotic." When in reality he seems to be neither of these. He's far more similar to Conrad. Both are affluent, middle-aged man-children with Dylan seeming the more stable of the two. Despite the over abundance of Anderson stylistic cues, the characters, dialogue, and delivery, for the most part, are very reminiscent of Woody Allen scripts, right down to the pseudo intellectual banter about art, classic literature, and French cinema. Speaking of which, they recreate the Madison dance scene from Jean Luc Goddard's "Band of Outsiders." I'd be remiss if I didn't mention the fact that I praised "Le Weekend," another film that recreated the dance scene, but it felt like it made sense in the context of that film, here it's just another added reference for the sake of making a reference. The film is so derivative that I began to wonder partway through whether Glanz was truly a lover of the styles he was deliberately ripping off, or if he is one of the detractors attempting to satirize them. Because the film is so blatant in it's imitation that it almost has to be a satirical commentary about the supposed pretentiousness of Anderson, Allen, and the French New Wave that inspired them (and every other indie filmmaker for that matter). It also seems a victim of its own logic. Beatrice and Conrad ride the subway in a later scene. They hear a man speaking to a woman about literature. He speaks about how pretentious he feels it is. Beatrice looks to Conrad and asks, "have you ever noticed how the people making fun of other people for being pretentious are usually the pretentious ones?" In the same way this is a pretentious commentary referencing everything Glanz seems to find pretentious. There are so many moments of commentary on itself that you start to wonder, if it is a satire, why it isn't more open about it. Particularly the scene where Jocelyn comments about the stage play that she Conrad, Beatrice, and Dylan have just come from. She complains that none of the characters in the play suffered any consequences for their actions, learned anything, nor were changed at all by the end. To which Conrad defends by informing her that it was a satire. This scene seems a thinly veiled attempt to describe the film we're watching as we watch it. There are some minor bits of humor that work, but most of it just doesn't. It's full of random observations that don't amount to much. No matter what Glanz intended by this film, this is style over substance, and worse yet, it isn't even his style.